By Yasha Levine, editor of The eXiled and investigative journalist covering Silicon Valley for Pando.com. You’ve probably seen my articles posted on NC every now and again. I want to let you know about a new book project that I’m working on — a project that I hope you’ll support. For the past year-and-a-half I’ve been covering the “Surveillance Valley” beat for San Francisco-based Pando Daily, investigating the for-profit surveillance business that powers Silicon Valley, and the ways in which this technology is increasingly being used to monitor and control our lives. I have exposed Google’s deep ties to US intelligence agencies and investigated Google’s role as a global for-profit intelligence agency — an entity that aims to capture and monetize as much of our activity in the real and online world as possible. I reported on the murky and criminal world of digital data brokers, and investigated the detailed dossiers that big tech companies compile on all of us. I have looked at Silicon Valley’s conflicted connections to tech watchdogs like EFF and privacy activists — people and organizations that are supposed to be fighting for our interests, not those of global tech. I have also revealed how the Pentagon and other US intel agencies are heavily involved in funding grassroots privacy activists and encryption technology — including just about every privacy tool endorsed by Edward Snowden. My work has been generously reviewed by Julian Assange, and has come to the attention of activists, scholars, journalists and politicians. I have received death threats for my reporting, but I have also gotten an amazing amount of encouragement and support from readers around the world. Above all else, my reporting revealed how worried we all are at the growing, unchecked economic and political power of Silicon Valley — and how little any of us really know about what’s going on in the boardrooms and faceless server farm-warehouses that power big tech. The more I reported on Silicon Valley, the more I was convinced that big tech’s reliance on surveillance to expand and maintain its power is a vital issue that needed to be explored deeper and at greater length. Now I’ve taken my reporting to the next level with an independent book project — and have launched a Kickstarter campaign to get it going. Since the start of the Internet revolution, we have been told that we are witnessing the dawn of a new and liberating technology — a technology that will decentralize power, topple entrenched bureaucracies, and bring more democracy and equality to the world. But the Internet did the exact opposite. It increased inequality, birthed massive global corporations, minted new billionaires (23 just last year in California), helped concentrate wealth and power, and expanded the reach of the U.S. National Security State. The more I thought about the book project and discussed it with my colleagues here at Pando, the more I became convinced that given the subject matter and the powerful corporate interests its taking on, Surveillance Valley should be an truly independent project — a project free of pressure from publishers, advertisers and investors. Surveillance Valley will be an extension of my reporting for Pando Daily: an old-fashioned work of investigative non-fiction that combines my previous work with new exposés, analysis, historical research and the work of scholars and journalists — all of it stitched together in a well-written, tightly argued and immaculately sourced page-turner that will change the way people think about the Internet. Some of the themes explored in Surveillance Valley will be familiar to those who’ve followed my work. But the book will go much deeper, exploring history and issues that I was only able address only in passing, or not all. 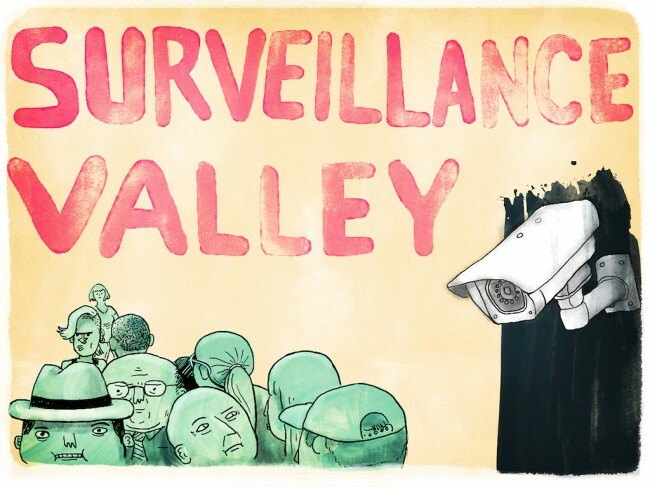 Surveillance Valley will be more than just a book about Silicon Valley’s surveillance business. It will tie the issue of big tech to the bigger political and economic problems of our times: oligarchy and runaway corporate power. Explore the Silicon Valley arms race: It will look at how other Silicon Valley companies — Amazon, eBay, Facebook, Microsoft — are in a race to dominate the lucrative military and intelligence contracting market, and show how they’re explicitly aiming to become the Boeings, Lockheed-Martins and Booz Allen Hamiltons of the Internet Age. Detail exactly what Silicon Valley knows about us: Companies like Google and Facebook aggressively mine user data to compile complex and detailed dossiers, extracting personal information on our personalities, income, interests and friends. What information do these companies collect exactly? This book will find out. Examine how Internet giants make money off invading our privacy: It will investigate the inner workings of the Silicon Valley’s for-profit surveillance business model. What do tech companies do with all the data they collect on us? Whom do they sell it to? How do they make money? Reveal how Silicon Valley polices our lives: There is a common misconception that no matter how much Silicon Valley companies spy on us, at least they don’t have the power to arrest and jail us. Truth is, they can and do. This book will investigate how the most progressive Internet companies — including eBay, Facebook and Google — engage in pro-active policing. For example: eBay’s massive private police alone has overseen thousands of arrests and convictions around the globe, and hands over complete criminal cases to government prosecutors “on a silver platter.” It will also reveal how these same leading New Economy companies like eBay and others work hand-in-glove with agencies like the DEA, FBI, Homeland Security and others, helping them monitor and arrest those they suspect of committing crimes. Investigate the growing political power of Silicon Valley: The book will look at big tech’s growing political and economic power, including Silicon Valley’s deepening alliance with the Koch brothers think-tank network and the ultra-conservative wing of the Republican Party. Tell the real history of the Internet: In the popular telling, the story of the Internet is one of freewheeling creativity and plucky entrepreneurship. But there is another protagonist in this adventure: Uncle Sam. The book will explore the central role that the U.S. government and military played in driving the development of computer technology — from the Cold War, to WWII and all the way back to the 19th century. Expose U.S. Government’s funding of privacy activists and anti-government privacy technology: The book will investigate and explain why the Pentagon — along with the State Department and other government agencies dedicated to expanding American power abroad — funds just about every open source Internet privacy technology in use today, including the Tor Project and other tools recommended by the Electronic Frontier Foundation. Help protect your privacy: Silicon Valley spends enormous resources to keep us ignorant and in the dark about the industry’s invasive surveillance practices. We can’t protect ourselves from what we don’t know exists. This book will fill this information vacuum and expose what big tech companies — Google, Amazon, Facebook, eBay — want to keep hidden from you. The Internet, and the greater global telecommunication infrastructure, is a central part of this bigger struggle. And that makes understanding the Internet — its history, its politics, its power, where it was and where it’s going — so crucial. It’s an important discussion for us to have, but it’s one that is not being heard nearly enough. Surveillance Valley will be my contribution to filling this void. If you’d like to contribute to the Kickstarter campaign, and be amongst the first to receive the book, you’ll find all the details here. Surveillance Valley art by Brad Jonas. This entry was posted in Guest Post, Notices, Politics, Social policy, Surveillance state, Technology and innovation on March 8, 2015 by Yves Smith. Thanks for posting about your new project here at NC. I’ve just backed it for a copy of the ebook. For some time now I’ve been of the opinion that there is an urgent need for someone to conduct a serious research that dissects the pervading ideology at Sillicon Valley. Exactly what I’ve been looking for! Good luck with your work and very much looking forward to reading the book. Kidding aside, most of the source material for your book shhould be relatively esay to find. Most of the more nefarious stuff was done in plain sight … in fact there were lots of triumphal marches and celebrations of amazingness. It is a wonderful story of human inventiveness, of collaboration, and of public intellectualism. It is a not so wonderful story of back-channel funding, hidden agendas, and corporate greed. It should be a good project. Have you considered adding a snail mail PO Box for donations? Me too. Will the book be available in hard copy? I use some of the products the EFF produces. I thought they were positive influences. Am I wrong? All of these entities are comprised of various individuals, all of whom probably have diverse loyalties. In my own experience, to give one example, I found EFF’s review of cloud storage security helpful, which led me to drop box, due to most pervasive encryption, and full disclosure of subpoena requests and fulfillment. Alas, the next thing i knew, Microsoft Onedrive, which i had tried everything possible to disable (it cannot be deleted) started manipulating my DB folders, and when I tried contacting DB about it in a service ticket, got no response, but only saw in my FB feed a few days later a press release stating that DB is partnering now with MS! From there I was a few clicks away from discovering the Drop Dropbox campaign, detailing Condoleeza Rice’s joining the Dropbox board (because of her tech background, dontchaknow! ), etc. etc. Unfortunately I made the mistake of paying my DB subscription for the year, but I have stopped using it, and have since used my 3rd party Firewall to block ALL microsoft programs from accessing the internet (except for svchost.exe without which I cannot connect at all.) With the firewall logging, I can see that Microsoft Windows OS (8.1) tries to connect to the internet (without my knowledge) about every 5-10 minutes of online connection. Where is the IP it is trying to connect? It is REDLANDS, WA! People have no idea how many “friends and foes” are watching their private computer files while they are online! If you have not got your disk drives encrypted and closed when online, and do not have your firewalls and unnecessary windows “services” (in task manager) disabled, you have a peeping Tom problem! Hence why Yasha Levine’s book is important. But like the Pando expose on Omidyar last week, there will be no harm in satisfying ourselves with some cursory background check on Levine too, despite (or because of) what Assange has to say. In humanities and theology, disclosure and foreclosure is the operating dialectic frame for hermeneutics! Tech and security weakness is humanities! 2. Yes, I am now in the process of moving away from MS OS to Linux for online work, and go back to Win 7 (and old 5) for offline Windows app work!! If memory serves they brushed aside reservations about defense department foundations of Tor and things like that. Anyway, I love Yasha’s work and I hope that enough people support this for it to become a reality. I just pledged to the Kickstarter campaign. EFF, including Tor, has always been heavily financed by the government, which should give anyone pause and which indeed needs to be investigated. Should heighten awareness, but not necessarily need to give pause. Regardless of who is writing, funding, or running Tor, will not change the fact that most internet users would be far safer running a USB Tails internet “condom” then being exposed to ALL of the STDs in the world, regardless of who can see them running it. Tor clients are hard-coded to route traffic using centralized servers known as Directory Authorities. Do you trust the government contractors who select these servers? If you read LulzSec co-founder Hector Monsegur’s rabble-rousing after he became an informant, he sounds a lot like Jacob Appelbaum. You do get to the crux of the matter! I think the anonymous Tails USB method will give you IP anonymity (even though algorithms can probably infer identity by online browsing patterns). Just running Tor from ff browser on the other hand, your whole computer is still exposed, regardless of your web behavior. The point is, as you suggest, that no third party can be trusted, no matter what company or government or individuals they purport to represent. It is all relative trust. In my own case, I think of myself as very uninteresting in terms of internet or even personal behavior offline. Thus it is my allegiance to my interpretation of constitution and right to privacy that really drives my security behaviors. I favor the VPNs and Sandbox apps of good antivirus programs in combination with skeptical posture toward the enterprise players like MS, Google, etc and therefore rarely use TOR, and favor non USA vendors, although these no doubt share my filtering with whomever they want. THe choice also likely depends on political geography. I am definitely in favor of Levine’s efforts and am glad to see the funds thermometer growing! It is a step in the direction of independent journalism and good shake-up for the social dynamics. I hope Levine will look at the antivirus software firms, as they are on the front lines. Everyday they scan our hard drives many times, and perhaps know our filter protocols. I see a future where Americans & Brits will use Chinese or Russian antivirus, and vice versa. Maybe that future is already arriving. IT cold war. what Bob Morris said re EFF and Tor. Discovered that about EFF quite a few years ago while spending a great deal of time perusing their site and connecting dots as to associated parties; always suspected that about TOR, given its US Navy inception. If you’re going to add the Valley Wage Rigging issue, you may want to add some research on – quite vital to society, yet disappearing, – non-tech vocations, and also the large part the Big Temp industry entities have played in the ongoing wage-rigging and benefits loss disaster. You and I both, on the hopes for a hardcopy (at the very least, a pdf file); though I have a feeling a Hardopy may up the budget significantly. I would also add an ability to purchase OFFLINE. (somewhat “off subject,” as regards Major Temp Industry Entities and Wage Rigging: I might add, that one or more Certain Major Temp Industry Parent[s] appear to have had their inception in the late forties, and one can only ponder how much the OSS > CIA could make use of such “TEMPORARY EMPLOYMENT” BROKERS where there’s a ‘perfectly valid reason’ why that ‘transient’ temp is not allowed into management meetings. The internet creates billionairs not because they are paid off by the Pentagon and the spooks but because they are seriously popular. What Levine is highlighting here is a step on the path. The internet remains primarily liberating and anarchic and there is noting the PTB can do to control it for more than a nanoseconfd or two. Sure it makes billionaires but if they are reliant on dodgy civil servants for their wealth its another case of mis-spent public money. Governments have always wanted to know what their people are talking about. I am an amateur historian interested in the period at the start of debt-based finance two centuries ago. At that time in UK there were two Post Master General’s, the chaps who controlled the Post Office, and one of them was appointed solely to organise the interception of mails to see if they were seditious or treasonous. I think Levine’s concern is that formerly liberal-minded geeks have been overwhelmed by the money and become as unprincipled as politicians. I really don’t buy that argument. Excuse me. But I will read the book. Perhaps I am wrong. Levine will have to convince me. Don’t fly in small planes. Make anyone you dine with sample your food before you eat any of it. Don’t go jogging alone or otherwise make yourself vulnerable. Use a car with a remote starting keychain option. thank you so for responding Y[asha] L[evine]; listening, actual response and actual follow-up of the response is such an underated, yet vital, neccessity of life, not found much “ONLINE” unless one is a ‘known name’. Thank you again. Thanks NC for spreading the word about Yasha’s fantastic initiative. I found it completely unsurprising that there are at the moment less than 300 backers – while a few weeks ago, some 220,000 enthusiastic Kickstarter fans backed “a card game for people who are into kittens and explosions and laser beams and sometimes goats.” Perhaps after you finish this Silicon Valley exposé, Yasha, you could take on the hedonistic, superficial, naive world of Kickstarter fandom. . . If someone could find a way to wake up Kickstarter’s base to the electronic noose that is right round their collective neck, maybe we could reverse these #s, and start a revolution.